A few years earlier, in May 1925, Pacific Telephone had opened its majestic new downtown office building, the Art Deco tower at 180 New Montgomery Street designed by the partnership of James R. Miller and Timothy L. Pflueger. At the time, it was described as “the largest building on the Pacific Coast devoted to the exclusive use of one concern.” It had a devoted “women’s cafeteria,” a library, assembly hall, rooftop recreational space — and of course a maze of office spaces for telephone company workers. The downtown building consolidated offices from across the city and housed no equipment, and would become one of San Francisco’s most celebrated buildings. The Art Deco flair, light-colored terra cotta and verticality of Miller and Pflueger’s downtown skyscraper clearly influenced Cobby’s neighborhood switching station at 1930 Steiner. Cobby’s three-story building, also of terra cotta, has three-over-three double-hung windows, with chunky spandrels and vertical pilasters that overshoot the roof, forming an undulating parapet. 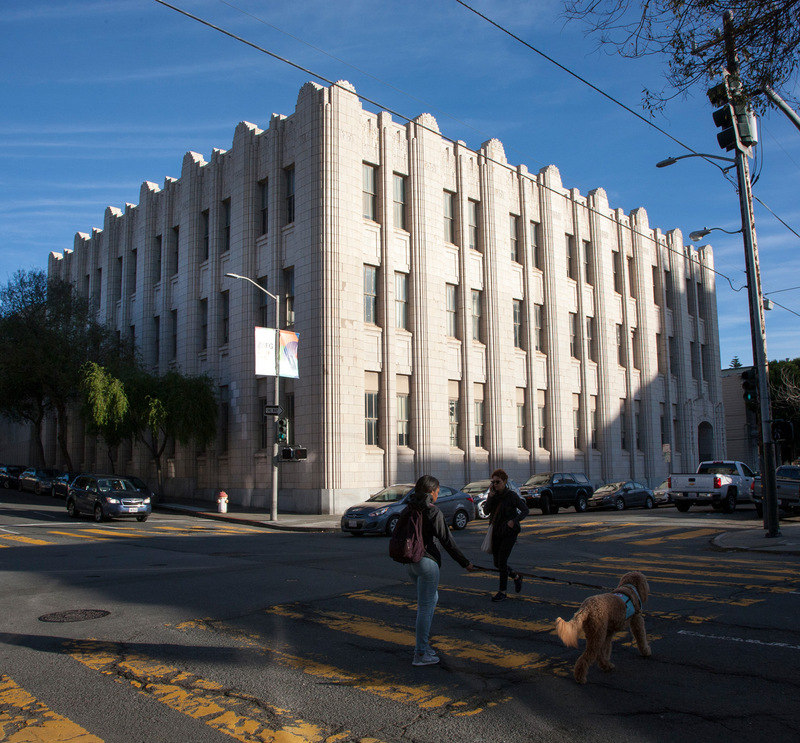 The parapet and entry both have decorative motifs that are somewhat Mayan in character, not unlike Pflueger’s famous medical building built in 1929 at 450 Sutter Street. Cobby was an employee of Pacific Telephone for almost 30 years and designed a number of switching stations throughout California. These crucial switching stations housed switchboards and equipment, as well as offices for the telephone company. As a means of helping the unemployment situation, the Pacific Telephone and Telegraph Company announced a “rush job” yesterday on a new $2.5 million building at the southeast corner of Pine and Steiner Streets. Originally scheduled in the 1933 program, this work has been put months ahead, with the expectation it will be completed next May. The new building is part of a $10 million Pacific Coast program, which has been similarly speeded up to relieve unemployment. . . . The new San Francisco building will house the Walnut, West and Fillmore exchanges. . . . This advancement of construction, which includes new and replacement projects, is a program dedicated not only to sound economic considerations, but to the telephone company’s playing its full part to help in this time of slackened employment. A few weeks later, in November 1931, the Chronicle again focused on the project, reporting: “It will be a three-story Class A structure, combining all of the new features being installed by this company in its changeover from the girl to the dial system.” The article suggested the new rotary dial phones had become immensely popular and that manned — or “girled” — stations were no longer necessary. While the building program employed construction workers, the completed, updated switching station would reduce the number of onsite employees. Other than his Pacific Telephone projects, few buildings by E. V. Cobby have been identified. By 1940, after his decades-long career with the telephone company, Cobby had his own architectural practice, sharing an office with his brother John, a building contractor. Cobby died in March 1961 at the age of 84, leaving the neighborhood a terra cotta architectural gem that also tells a story about advancements in telephone technology. 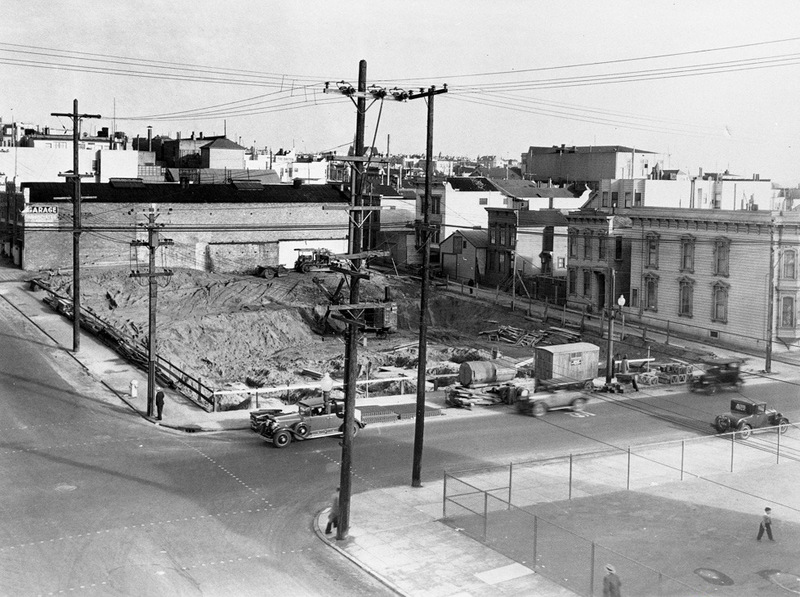 Photograph of construction at Pine and Steiner in 1931 from OpenSFHistory.org.